Kindly contributed by Rachel Martin (Micro Plot). I was recently given a huge and impressive-looking cauliflower by another plotter, Stuart. I’m new to this allotment gig and my plot has not produced very much so it was very welcome. I gratefully took it home and wondered what to do with it. I’m not particularly fond of cooking but I enjoy eating very much. I’m also conscious that I need to eat more fresh vegetables and less processed food, one of the many reasons to have an allotment, but I want the fresh food to taste just as good. I made a delicious cauliflower cheese without using any cheese. I put the garlic and a bit of water in a saucepan and cooked them for a few minutes before adding everything else. I then added more water until I was happy with the consistency of the sauce. I’m not sure exactly how much water I added but possibly a cup or two. Then I poured it over my cauliflower and baked it in the oven for around 10-15 minutes. 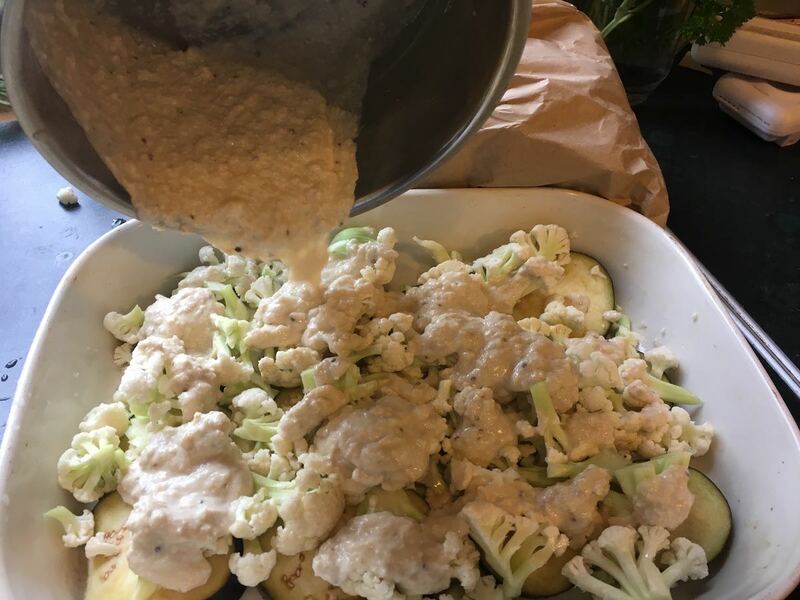 I like cauliflower when it’s still a bit crunchy but if you prefer it soft then it can be cooked for longer. It was delicious and very easy to make. I buy whole cashew nuts and grind them up using a coffee grinder. They’re a really great replacement for cheese but without all the cholesterol of cheese.